Orderly examination of empire, religion and the will of God. Sociologist Bonn (Painting Life: The Art of Pieter Bruegel, the Elder, 2007) uses the biblical tale of the Tower of Babel as a jumping-off point for exploring the history of empire. Bonn works under the presumption that Babel is a myth, meant to characterize the rise and fall not of a tower but of the Babylonian Empire. Still, he sees in the story an elegant archetype for examining all empires. Further, Bonn points to the history of Christianity (as a faith tradition, not as an organized religion) as pointing the way toward a reversal of the Babel story. Drawing upon a breadth of knowledge, the author also sees history from a unique, overarching perspective. He begins with a brief, yet thorough, overview of ancient history, especially the histories of Babylon and Israel, which flows into a history of the Roman Empire and the advent of Christianity. 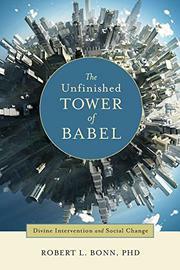 Through the Christian faith, Bonn says, God and his followers began the process of reversing the effects of the Tower of Babel—the disbursement of peoples began to contract, as followers of Christ found a single reason to come back together. In examples such as the Day of Pentecost, this included a shared language as well. “It was in spreading the message of Christianity throughout the Roman Empire,” the author says, “that the early Christians came to reverse the logic of the myth of the Tower of Babel.” However, following history further, Bonn explains that the established church in Rome began to pervert the faith into yet another empire. As with all empires, as it gained in size and stature, God caused its downfall. Thus, Bonn explains, even the established church itself was broken apart by the Protestant Reformation and the Enlightenment. Bonn goes on to apply his theory to the modern world, explaining that it is not functional success (personified now by great towers—skyscrapers) which is problematic, but instead pride, avarice and wanton power. A sizable portion of Bonn’s work is concerned with explaining world history, often with facts and figures that, while they could provide background for a novice, largely do not affect his arguments. He follows his thesis through from the dawn of Western history to modern times, but his already slim volume could be pared down further without threatening his ideas.